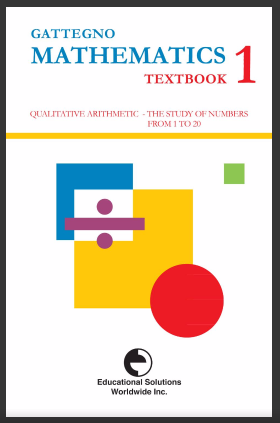 We're still doing an in-depth look at number studies found in chapter 6 of Gattegno Mathematics Textbook 1. You can get the book free by clicking on the image. This post covers single color trains and the number 11. Since there is too much to cover in one go, I'll be tackling this in multiple posts. This post will cover single color trains and reading the trains as multiplication and division. One of the things I talked about in my last post on number sense was how Gattegno introduces symbols in a context, or structure, that limits variation but provides for the expansion of possibilities without breaking the structure. We create a structure - let's say a orange rod - and we make single color train patterns for that rod: white, red, and yellow. The variations are limited. There are only so many single color trains for the orange rod. But, we can approach this structure and describe it in a nearly endless number of ways and it doesn't change the structure. Single color trains lend themselves to the study of multiplication, fractions and division. But that doesn't mean we can't use addition and subtraction or a combination of all of them. We could choose to use color names to talk about this structure or we can use number names. We can measure the orange rod by a white and call it 10 or we can call the orange rod one and then white becomes 1/10. If we call the orange 2 - white becomes 1/5. The orange rod contains 2 of the two squared, it also contains one two cubed. In addition to learning to count in different ways, we're laying the groundwork for understanding how polynomials are made not just how to solve for x.
Gattegno calls this getting a lot from a little. 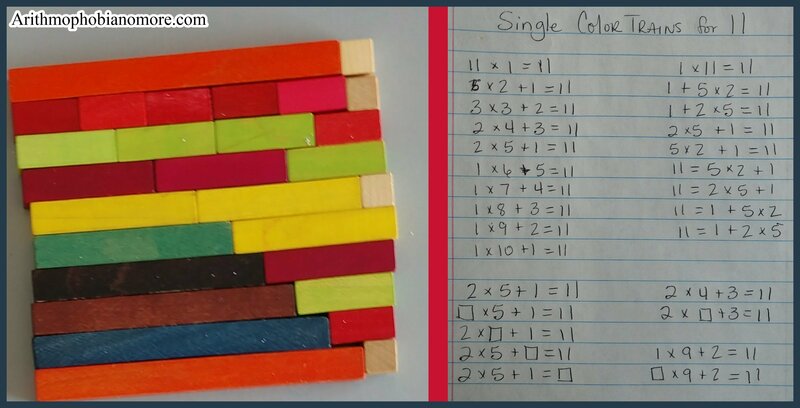 I love this way of teaching mathematics. Instead of painting a veneer of flexibility over the top of a rigid, getting the right answer approach, students work flexibly from the very beginning. Students develop a strong, intuitive understanding of how math works. Task 1: Form all single color trains for the number 11 starting with the white rod. Once we've made our trains there's something we notice right away. There are no single color trains for eleven except the white rod train. When that happens we call that number prime. We will note that on our Table Of Factors in our math notebook. Prime numbers have exactly 2 factors. One and itself. Note that 1 is not a prime number. Primes have exactly 2 factors. The number one has only one factor. Since I introduced square numbers to P. years ago, we will also note whether or not the number is a square number. Eleven is not a square number. Now that we have a pattern for single color trains. We're going to read them, as P reads the rods, I will write them in his math notebook. He reads them as multiplication first. Sometimes after reading we'll take some time to notice what is happening, and sometimes not. It all depends on the mood we are in. After reading the statements using multiplication, he'll read them as division with the remainder in numerical form and then read them again with the remainder in fractional form. At least once or more, you need to let your students do some noticing with respect to the remainders and their fractions. A remainder of 3 when the divisor is 4, lets you know that you are nearly to another four - 3/4 of the way there. A remainder of 3 when the divisor is 8 tells you that you are less than 1/2 way to another eight - only 3/8 of the way there. These kinds of conversations help students make sense of what they are doing and the facts they are discovering. Far more important than getting a correct information is understanding why that information is important and what they can do with it. This increases their flexibility with numbers. 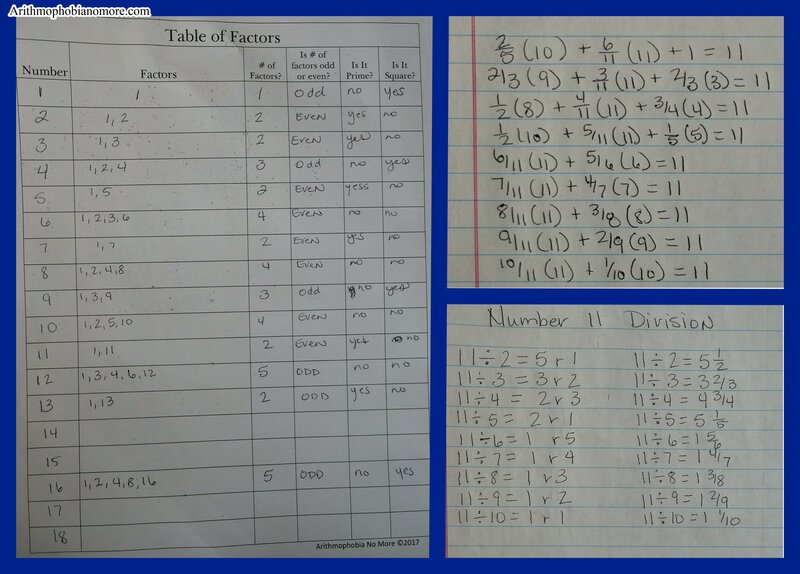 Make sure that either you or your student is noting all of the math they are creating in their math notebook. We will take a few statements a rewrite them in different forms. We will also take a few a rewrite them with numbers missing. I will give these back to P. a week or so later for him to solve. In the above video, what was interesting to me is that P., who has an excellent foundation in fractions, was unable to take what he knew and apply it to remainders. Not only that, but once the confusion set in, it was as if he had never encountered fractions ever. I had to walk him through what he already knows and just remind him. I could see what he was doing. He wanted to take a red rod and apply it to any number as he saw fit. Which is usually what we do with fractions. In this case, I wanted something specific and he was stuck and fearful. I see this same phenomenon with some of the moms in our study group. It is almost like a wiping of the brain. It's probably a bit like having a disapproving boss stand over the top of you at work. When that happened I had to take him back to what he knew for sure, re-establish a sure footing, and then move forward. He knows how to read fractions, so that is where I went and then we moved forward. Since this has happened more than once, it's in our orbit of awareness. The next time this happens we'll be able to stop and help P. attend to what is happening internally so he can walk himself through the process by himself - or that's the goal. The point of all these exercises is not to get the right answer, though we want right answers. The most valuable lesson P. is likely to take from this is not fractional remainders for 11, but knowing that he has a hard time thinking when he doesn't immediately know the answer. It will be a real triumph if he can overcome that. Don't rush through these exercises to get them done, talk about them. Share your ideas with your kids and listen to them while they share theirs. They do have good math ideas. Want to keep this for reference? Click here, I'll send this to you as a PDF.